Throughout these so-called weeks of Ordinary Time we have been reading from the Gospel of Saint Luke at Sunday Mass; Tuesday is his feastday. 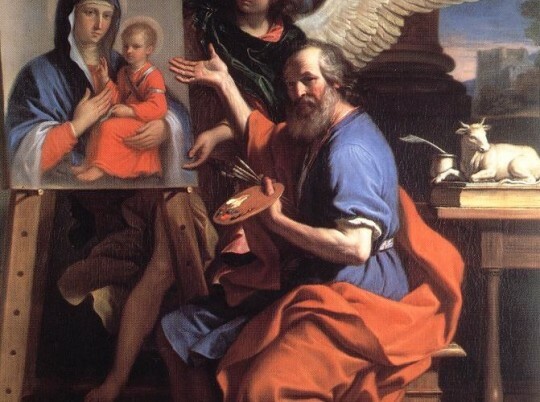 According to tradition Saint Luke is the author of the third Gospel and the Acts of the Apostles. He was a physician and painted an image of Our Blessed Lady which is reputedly the basis for the famous image in the Basilica of Saint Mary Major in Rome, known as Salus Populi Romani, Health of the Roman People. Saint Luke gives us many examples of the mercy of Jesus which we have been hearing over the past few weeks and he also gives us some strong models for prayer. The Gospel of this Sunday is an exhortation to persevering prayer. Jesus tells us to never give up praying, never stop asking God for what we need. God always gives us what we ask, if it is for our good. Sometimes He makes us wait, as though He wants us to be convinced that we really want what we are praying for. God grants our requests, sometimes in ways we did not expect, but usually over and above what we ask for. In the Magnificat, Mary announces that He has filled the hungry with good things, and sent the rich away empty. We go to God like needy children but as children confident that our Father God will look kindly upon us. With Saint Luke, we can go to Mary - and in this month of the Holy Rosary - know that we have a Mother in Heaven who is conscious of, and responsive to, our daily needs. With every blessing.